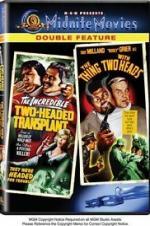 Buy or Rent The Incredible 2-Headed Transplant (1971) Movie DVD & BluRay Online! Movie Plot: Dr. Roger Girard is a rich scientist conducting experiments on head transplantation. His caretaker has a son, Danny, who, although fully grown, has the mind of child. One day an escaped psycho-killer invades Girard’s home, killing Danny’s father before being gunned down himself. With the maniac dying and Danny deeply unsettled by his father’s death, Dr. Girard decides to take the final step and transplant the killer’s head onto Danny’s body. Of course, things go horribly wrong and the two-headed creature escapes to terrorize the countryside.